Pearland Soccer is a new organization in partnership with Shadow Creek Soccer and open to any Texas resident. Our aim is for residents who live East of 288 (Central and East Pearland) to compete against other Central and East Pearland recreation teams. Currently most East 288 teams practice close to home and complete against Shadow Creek Soccer Recreation Teams. Pearland Soccer is also be the NEW OFFICIAL name of all Shadow Creek SELECT Teams. Does PEARLAND SOCCER HAVE COMPETITIVE SELECT TEAMS? Yes, we currently have Elite competitive teams in these birth years: boys and girls 2004, 2005, 2006, 2007, 2008, 2009. Note that cost is 4X LESS than most other clubs. Your team has the option of hiring a Coach/Trainer or using a mentored and licensed parent coach and/OR joining TTi for Pro Training. Yes for practices and we hope most games. Currently age 10 and up (U11-U18 & Adult) play all games at Hickory Park Sunday afternoon. Ages 4-9 currently have games at York Elementary on Saturday mornings 8-noon (these fields are some of the best in Houston). We will strive to form recreational teams according to location while also trying to balance teams according to ability. Grouping teams by neighborhood and general location will allow for easy practices. This is our goal and cannot guarantee 100%. If Pearland Soccer grows in numbers, we will easily hold some rec games at Hickory Park. Note that Shadow Creek has so many rec teams, we do not need to travel - For example, our U10 boys league has 12 teams. Eventually Pearland Soccer will have a large enough Rec league to play most or all games at Hickory. And Rec tournaments between the two clubs should prove to be a blast! If we live east of 288, are we guaranteed to be on a Rec team that practices east of 288? That is our goal; however, this depends on number of signups. Shadow Creek Soccer Recreational league currently has many East 288 families, and some current teams are already 100% East 288. Are you affiliated with Pearland United? No; however, we have over 100 former Pearland United players in our Recreational league and many former PU players on our Select Teams. One Select team is 99% former Pearland United. We welcome new players and full teams to joins us. If we live East 288, can we still practice and Play our games at shadow Creek? If this is your preference, yes; we will place you on a West 288 team. WHO WILL BE OUR TEAM COACH? Parents serve as team coaches. It's best to have two parents to share the coaching. If no one wants to coach, you can assign a different parent to coach each week. Our Coaching Director will provide mentoring, clinics, coaching manual, and video links to practice ideas. Is the Rec league competitive? Yes, we balance teams so scores are close and teams compete. Although there are no official standings, players count goals and want to win. But we emphasize to coaches, parents, and players, that learning the game and enjoying the game is most important. Why don't you keep score? To keep the focus on becoming a better player, to learn how to play the game instead of playing kick-ball, and to keep parents chilled. Yes we have youth ages 12 and up from the local community. While a license is not required, we encourage obtaining a license by paying 50% of your child's license fee and also paying more per game for licensed referees. If your child wants to referee, contact our referee coordinator. Games are held at both York elementary and Hickory Slough Sports Park near Dawson High School. U12 games are played Saturday afternoons at Hickory Park. U15 Sunday afternoons at York. More games will be played at Hickory for ages 4-9 with the addition of more East 288 teams. We try to announce teams by September 1 for fall season and March 1 for spring season. Fall practices can start after labor day & spring practices late March after spring break. However, you are free to begin practices sooner. Select teams are a step above Recreation Teams. More practices and players with higher level skills create stronger teams able to compete in Houston competitive leagues. Recreation teams in Shadow Creek and Pearland Soccer are also competitive, but all games are in Pearland and practices are usually once a week. Fall through spring is $800. This includes 2 select uniforms, backpack, about 12 select games, insurance, and use of a lighted field. Teams are coached by player parents or a hired coach/trainer. If the team decides to hire a trainer there is an additional cost. We encourage all select players to take advantage of the M-F all year TTi pro training at a reasonable cost. I currently play on another club's select team...can our whole team join Pearland Soccer and keep our team together? YES. We also will work with your current trainer if your team wants to keep him or her and INCREASE trainer/coach compensation compared to current arrangements. Does our Parent coach have to have a Coaching License? Yes, all coaches and assistant coaches need to have a minimum of a USSF Grass Roots or equivalent within 1 year of coaching. What league will our select team play in? Does every player get to play 50% of each select game? Yes ! 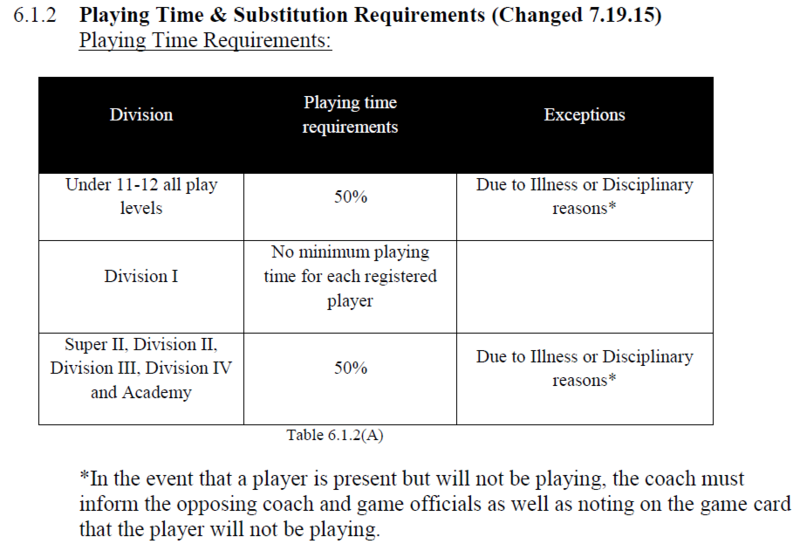 South Texas Youth Soccer Rule 6.1.2 states that only Division I teams are allowed to vary player on field time. Division II and below teams at ALL ages must play ALL players 50% on the field (exceptions are only made for injuries and disciplinary reasons). Pearland Soccer will strictly enforce this rule. Division 1 leagues start at age 13. Where do I find the 50% rule? HOW DO I ENSURE THAT I PLAY AT LEAST 50% ON THE FIELD DURING A SELECT GAME? IS THERE ANY FINANCIAL ASSISTANCE POSSIBLE?